I thought I should give you a quick update. Over the summer Whitehall Watch will be changing. First of all, Whitehall Watch will slowly become more of a multi-author blog, drawing on our community of “Whitehall Watchers” at Manchester, and, we hope more widely. We will be inviting anyone who shares our interest in Whitehall, and public administration and public management more widely, to send us posts (for now you can send them to policy@manchester.ac.uk but we will have dedicated email shortly). I’ll still be here, blogging away, but hopefully the voices you hear here will become a bit more diverse. Second, Whitehall Watch will become part of a a family of Manchester Policy Blogs. these are in the process of development, but will almost certainly include blogs dealing with Science, Technology and Environment Policy; Gender Equality Policy; Education Policy; and others. These will also be open to others to contribute. Again, you can use policy@manchester.ac.uk to contact us. It’s been a tremendous adventure experimenting with Whitehall Watch over the past three and half years. When I launched it I never thought it would gain the traction it has. But now it’s time to renew and innovate a bit more. 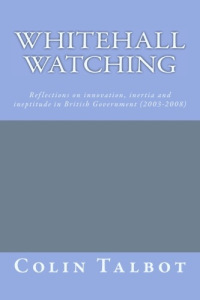 Whitehall Watch will be more plural in its authorship, but hopefully a bit more focussed in its content. Over the past three years its given a ‘home’ to some of my thoughts which were sometimes slightly “off piste” or more personal. Some of this I’ll pursue on our other blogs from time to time. Some will shift to a small personal blog space I’ve set up here, https://colinrtalbot.wordpress.com, if any of you are interested. To those who have encouraged me with this project, thanks, very many thanks. To those who said (and some still say) blogging is a waste of time for academics I say: just remember who pays your wages. We live, directly or indirectly, at societies expense and we owe it society to give something back. Oh, and BTW it did work, I think. As we’re becoming more ‘institutionalised’ we’ll be having a (very) few rules of the game: here’s our (draft) Editorial Policy for Manchester Policy Blogs (including Whitehall Watch). The articles give the views of the author(s), and not the position of Manchester Policy Blog, the Policy@Manchester Network, or of The University of Manchester. We encourage the submission of material that focuses on substantive insights or research as it pertains to aspects of public policy in the UK and internationally. We draw primarily on the community of academics and researchers at The University of Manchester, but we welcome contributions from other universities and research organisations, as well as individuals from organisations with an interest in public policy issues and topics as long as they conform to our standards. Contributions to the blog are neither academic papers nor bureaucratic publications. Nor should posts be a mere description of a particular issue in public policy. Relevance – A clear link to a current policy issue, decision or consultation. Research – A new piece of research evidence, or reference to an academic debate or theory that is relevant to current policy processes or debates. Relaxed style – Blogs tend to be direct and informal in order to be accessible to a wider audience. Reading further – Abundant links to additional sources and useful evidence. Occasionally we may request that authors rewrite articles to provide additional research or a novel evidence based conclusion. Posts that cover events should focus on what key points, findings or arguments are most useful to take away from the event, whilst taking account of applicable Chatham House rules. The goal of covering events is to share with a wider audience how an event moved policy debate forward rather than to just report that an event happened. If you are unsure whether what you plan to write will be suitable and accepted, please contact the Blog Team (details below). All contributions that are submitted for publication will be acknowledged by a member of the Manchester Policy Blog editorial and production team as soon as possible. If an article is deemed not to meet the requirements for a Manchester Policy Blog post, we will advise authors on how best to rewrite articles so that we are able to publish them. Articles will be reviewed by members of the Blog team, who may edit the piece to enhance readability to the blog’s wider audience. Removal of specialist jargon or overly academic language that might confuse the lay reader. Re-ordering of text to follow the Inverted Pyramid model. Where major edits have been made, the final version will be sent back to the author for approval. Occasionally, further information may be requested to aid the production of visual materials to support the post. Please note that owing to events and other circumstances beyond our control, we may have to change our posting order at very short notice, which will results in blog posts being published sooner than expected. Due to time pressures of the production cycle, authors may have less than 24 hours to approve our edits. Please also note that we will not generally delay publication to await approval for edits. Therefore, once you have submitted a post, please ensure you are available on email in the proceeding 48-72 hours to respond to edited posts that are sent to you by the Blog Team. Once articles are published, we are very happy to make further edits afterwards should the author deem them to be necessary. All of our articles are also published under the Creative Commons licence, (XXXXXX) and other blogs and publications are free to use them, with attribution. We gratefully acknowledge the support and guidance from the team at the LSE British Policy and Politics blog on our editorial policies. All very interesting! By the way I had not before heard of the “Inverted Pyramid Model”! What I can recall was an editing process known as “The Pyramid Principle” which was invented and pioneered by one Barbara Minto and used very extensively from the late 1960s onwards by McKinsey & Co (and the like)! At base it was about how to identify major and minor ideas and how to place them in a comprehensive structure that could be readily grasped and understood. Thus it embraced the whole structure of a presentation and yet with a discipline that also involved all intermediate layouts and detailed editing. At that time Minto told me that she regarded the London Business School as “one of her charities”!! Certainly Ministers really loved it – because for them it showed a very virile ability to “cut a problem down to size”. My own objection was that it was then, as often as not, no longer the problem!! Hmm! So now I look forward to hearing about “The Inverted Pyramid”. BTW, Whitehall Watch has worked brilliantly! Always insightful and thought provoking. Thank you.